Imagine having a newspaper or magazine that was written just for you, automatically updated and sent to you whenever a new relevant story was added. Say hello to Google Reader. Once you’ve created an account, you can start adding sites you want to subscribe to. It’s easy… just click the “Add a subscription” button at the top right and type in the URL of the blog (for example “joreteg.com”). That’s it you just added your first feed! Now you can add as many as you want and then all you’ve gotta do is go back to Google Reader and check for unread items. If you want to see a story in it’s original form, you just click the title of the post to go to the page where it came from. Google Reader lets you subscribe to any website that publishes content feeds. The good news is that these days pretty much all blogs and news outlets publish feeds. 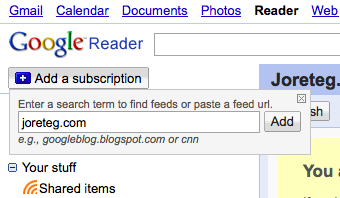 You can add feeds directly from within Google Reader or you can look for feed links while you’re browsing. Anytime you see this or any mention of RSS or a feed you can click on it and if you’re using a modern browser (I recommend Chrome or Firefox) it will give you the option of subscribing using the program/service of your choice. Many browsers will also display a feed icon in the address bar to indicate when a site has a feed. Now you can easily stay current with the sites and authors you like without having to check lots of different sites, scouring for new content. I check Google Reader daily. Once you experience the convenience of it you’ll realize why paper is history. To see how the dynamic web is changing our cultural anthropology check out this amazing video, as brought to my attention by my friend and co-worker Josh Highland. It’s well worth your time and will make you think.